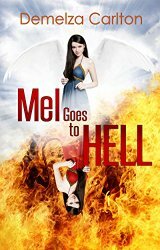 In the third book in Demelza Carlton’s Hell series, Mel takes it upon herself to try and rescue Luce, after he mistakenly believes that he has killed her and returns himself to Hell. The book is an entertaining romp as Mel determinedly makes her way through the various levels of Hell, and we’re introduced to a cast of madcap and crazy characters who are in charge of the various levels. These characters are delightfully flawed, thoroughly entertaining, and beautifully written by an author who truly creates an enjoyable romp through mythology mixed with 21st century situations. It’s so much fun to read about Demelza’s characters and they come alive and have the ability to create a great amount of amusement in this particular reader’s mind. I thoroughly recommend these books to other readers, and I’m looking forward to the release of the fourth book in the series when it becomes available in 2015.